I have a 2004, sig 350 and have replaced several gauges over the last few seasons. I have opted not to actually change to new technology, but have replaced with new replacement units from Cecil Marine that were drop in plug 'n play. Call and talk to Joe there, he is super helpful, very knowledgable and can definitely guide you. 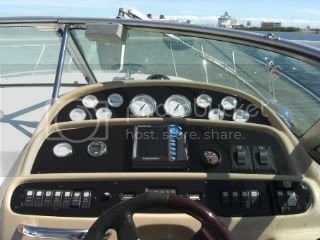 Phone (856) 629-4606 and website is www.cecilmarine.com. I said quite a few choice words at my failing dual tach until I found Joe. Now I'm a happy capt'n again when I can read and rely on my gauges. Not sure about 2008, but if you are also suffering from chipping, cracking clear coat and bubbling finish on dash panels as I have with mine, I can refer you to an awesome refinishing service in FL. I've sent several to them and they come back good as new. You spend a lot of time looking at your dash and gauges if you cruise any distance. I hated looking at cloudy, faded gauges set in a chipping, peeling dash. Good luck! Thanks for the info Mark. Sounds like we've experienced the same problems. My dual tach is definitely the worst of my group with moisture and fog. I opened the gauge and corrected the moisture problem, but the fog makes the digital display unreadable. I also have a blank gauge that has a black background that is cracked. I am experiencing some bubbling on my dash panels and would very much like to have the contact info for the refinishing company. I'm actually in the Tampa / St Petersburg area so a Florida company makes it convenient. Thanks again for sharing your info. Cheers to great boating! How did you solve the moisture/fogging problem? Sorry for the delayed response - been traveling. I actually just took it apart (carefully), cleaned the inside glass, and cleaned the seal before re-assembling. Haven't had any more issues with the fogging. I had a guy in the port make the dash plates from a heavy duty plastic....charged me 75$! The gauges in my old 280 were sealed, could not even change a bulb. Panels look good. Maybe the same guy could make me a plastic or lexan door for my galley where the TV was, who did the work? My gauges are the stockers, and I just noticed one of the backlights is failing. I'm not sure what I'll do as I have the VesselView up and running now. Mine are Faria, but the tach is a dual tach with digital readout at bottom. The digital area is becoming unreadable and that's where I get my boat data.